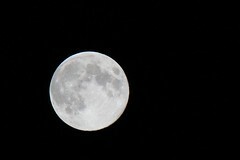 Our moon - photo by ME! Way back, my first degree was in science - I then taught science in grades 8-12 for many years. Over time, my main interest turned to educational technology and I moved on in my career. As my role changed to administration and then into teacher education, my interest (passion?) for science faded, but was always in the background. A few events in the past few years and some reminiscing brought my interest in science back to the forefront. This past term I taught a Science Methods course. While I admit I was a bit rusty on some details, it was enjoyable. I concentrated on teaching process - inquiry, design - I have witnessed too many science courses taught as 'read the chapter and answer questions' - that is not science. When I return from sabbatical I will be moving into teaching science methods (as well as my main area of ed tech) - while I have some work to do to get back up to speed and planning my program, I am looking forward to the challenge with excitement. During my sabbatical I will do some gathering of resources and planning for this new adventure.